We understand the choice of your builder is the single most critical step in the realization of your dream home in North Dallas. If you are in need of a custom home builder to design and build on your lot, DFW Improved is the right choice for you. Should you need assistance finding the perfect place for your new home, we are available to help you with that as well. DFW Improved utilizes name brand materials that you know and trust in our homes to provide you with the highest quality construction available for your budget. Through a collaborative design effort with a high emphasis on your needs and wants we achieve a truly unique architectural design. This process ensures we have the right spaces in the right places, just as you would have them. Our professional design team will assist you with selecting the right choices to personalize your home to suit your individual style. Every home site is truly unique in size, shape, and character. After viewing your new home site, our professional team will assist you in establishing the level of detail and finish-out that best meets your needs. We then determine a price that makes it all happen while adhering to your budget. At DFW Improved we take the term “custom” in Custom Homes very seriously. When it’s time to build your new home, we will help you plan every inch of property. From framing, to flooring, to finishes, we will help you select every visible aspect of your dream home (and many unseen elements, too). We will help you lay out and size rooms including ceiling heights and styles, pick features and lighting, and select floor styles — carpet, tile, wood, you name it. We will discuss furnishings with you as well, such as bookcases, fireplaces, countertops, everything! With more than 25 years of combined experience as homebuilders, we are a licensed general contractor capable of handling a vast array of professional construction projects. We understand that the planning process can get quite overwhelming if you are new to custom homes, but we are here to guide you. We believe that when it comes to the investment you make in your home, you’ll want peace knowing that a group of professionals is helping you make the decision of a lifetime. Not sure what your dream looks like yet? That’s what DFW Improved is here for, and we understand your budget needs. Call us now to speak to a representative – whether it’s about your new home in Frisco, McKinney, Allen, Prosper, or any other home site in the North Dallas area, we can help. The design process can be broken down into four phases: Preliminary Design, Schematic Design, Design Development, and Construction Document phases. The Preliminary Design phase consists of a review of the owner’s Program Outline, budget , and floorplan, if available, and/or assisting the owner in developing these criteria; researching applicable local city zoning and building code requirements for the project; and developing concept floor plans from the previous criteria to establish spacial relationships and approximate square footages for the project. The Schematic Design phase consists of producing presentation drawings of refined concept floor plans, including approximate square footages; producing rendered elevation sketches to describe the material’s stylistic character, and overall massing of the of the proposed residence; assisting the owner in selecting a contractor, if needed; and assisting the owner in selecting any required or requested consultant, i.e. structural, lighting, landscape, etc. The Design Development phase consists of translating the approved Schematic Design floor plan with any owner-requested modifications into a computer-generated format and reproduce at 1/4″ = 1′- 0″ scale, with precise square footage information for owner’s review; and producing a roof plan and designing the rear and associated side elevations based upon the schematic front elevation, which will be coordinated to create a logical, holistic crafted structure. 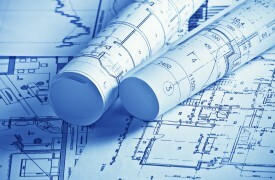 The Construction Document phase consists of finalizing building and zoning codification, and review with authorities having jurisdiction; producing a Construction Document package for pricing and construction of the project; and participating in owner, contractor, and inter-professional conferences as required for the timely and effective completion of the project. Ready to Build on Your Lot? Your Custom Home is In Reach with DFW Improved. Schedule a visit to showroom today or contact us for an estimate.